iii. The time period for filing GSTR-2 and GSTR-3 for the months of July, 2017 to March 2018 would be worked out by a Committee of Officers. However, filing of GSTR-1 will continue for the entire period without requiring filing of GSTR-2 & GSTR-3 for the previous month / period. 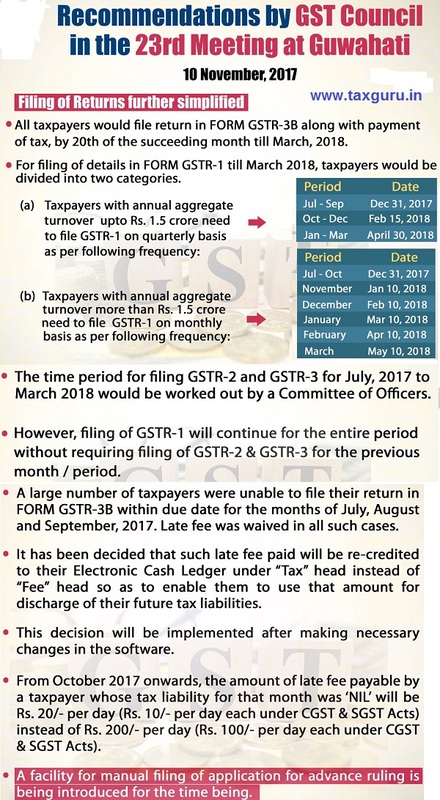 b) A large number of taxpayers were unable to file their return in FORM GSTR-3B within due date for the months of July, August and September, 2017. Late fee was waived in all such cases. It has been decided that where such late fee was paid, it will be re-credited to their Electronic Cash Ledger under “Tax” head instead of “Fee” head so as to enable them to use that amount for discharge of their future tax liabilities. The software changes for this would be made and thereafter this decision will be implemented. c) For subsequent months, i.e. October 2017 on wards, the amount of late fee payable by a taxpayer whose tax liability for that month was ‘NIL’ will be Rs. 20/- per day (Rs. 10/- per day each under CGST & SGST Acts) instead of Rs. 200/- per day (Rs. 100/- per day each under CGST & SGST Acts). e) Exports of services to Nepal and Bhutan have already been exempted from GST. It has now been decided that such exporters will also be eligible for claiming Input Tax Credit in respect of goods or services used for effecting such exempt supply of servicesto Nepal and Bhutan. f) In an earlier meeting of the GST Council, it was decided to exempt those service providers whose annual aggregate turnover is less than Rs. 20 lakhs (Rs. 10 lakhs in special category states except J & K) from obtaining registration even if they are making inter-State taxable supplies of services. As a further measure towards taxpayer facilitation, it has been decided to exempt such suppliers providing services through an e-commerce platform from obtaining compulsory registration provided their aggregate turnover does not exceed twenty lakh rupees. As a result, all service providers, whether supplying intra- State, inter-State or through e-commerce operator, will be exempt from obtaining GST registration, provided their aggregate turnover does not exceed Rs. 20 lakhs (Rs. 10 lakhs in special category States except J & K). I have registered my self under GST as I was providing services which were interstate. I collected the GST and paid it to Govt on monthly basis. but now due to amendment I am not liable for GST as my total receipts is less than 20 lakhs during the year and no registration is required under GST in case the total turnover is less than Rs 20 Lakhs. Please guide me Cam I surrender my GST and if so how I can surrender the GST being my turnover less than Rs 20 lakhs a year. As per current amendments in GST, a person whos annual aggregate turnover is less than Rs. 20 lakhs is exempt from obtaining registration even if they are making inter-State taxable supplies of services. Hence you can cancel the registration anytime if you fall under the above specified limit. For the same, A taxpayer can submit an application electronically in FORM GST REG-29 at the common portal. Step 2 :- The Cancellation page opens. Your GSTIN and name of business will show automatically. You are required to give a reason for cancellation. You will be asked if you have issued any tax invoices during the month. If you have issued any taxable invoice, Then Form “GST REG-16” needs to be filied.